Fantastic. This really sounds like an incredible mad scientist device. Some pictures would be great! 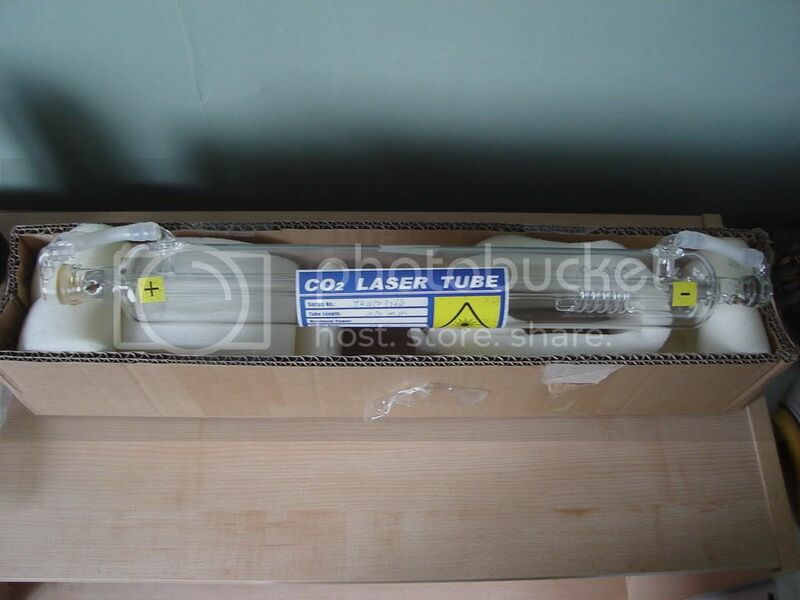 The quest begins here, with the arrival of the laser tube. 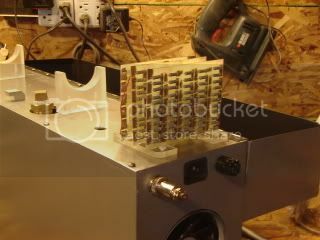 This heat sink assembly was converted into a heat exchanger by adding a welded aluminum box & pipe threads to the back. Necessary as the tube is water cooled. 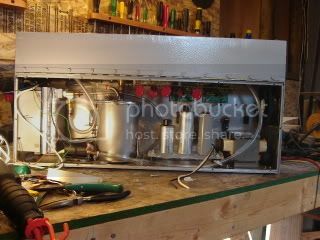 This is the cabinet, with the major power supply & cooling system components mounted. 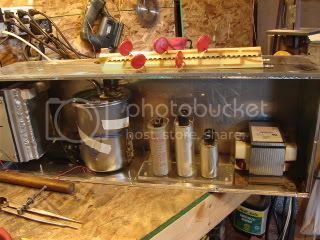 This is a shot of the cooling system pump & reservoir. 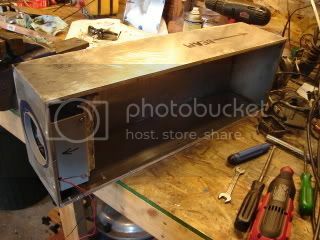 The reservior is a thinwall stainless steel tank, from a water cooler. 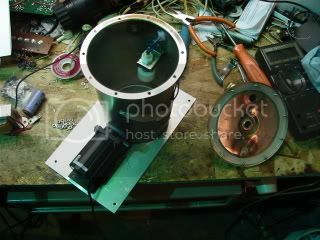 This shows the heat exchanger mounted. 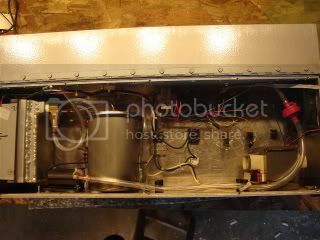 This shows the cabinet mostly complete, with the heat exchanger mounted. Here is the inside of the cabinet, with most components mounted. Here is the front panel, with the tube deck lid closed. This shows the tube deck & mounting brackets. The completed cooling system, installed. This shows the ballast resistor array, as well as the AC input socket & remote control plug. The brass fitting in the middle of the tube deck is to access the cooling system for filling & draining. The cooling system is totally sealed & does not require periodic topping up. A close up of the first stage capacitor module. 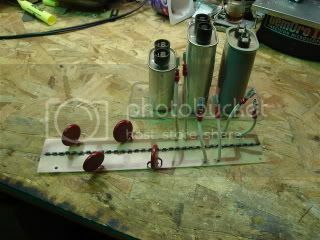 This connects to the voltage multiplier board, & contains the caps that provide the tube operating current. The laser is physically complete in this shot. This end contains the air intake filter, as well as the beam exit port. A shot of the tube deck, with the tube installed. Currently, I have the VM board on the bench, where I hve just replaced the 32 1N4007s, that I originally used, with 8 microwave oven diodes. Hopefully, this time it will work. That is a work of art, nice job on the control panel! Thanx. I couldn't resist the warning label. I also have to rework my metering, as the power supply fault took out both DPMs & their associated circuitry. However, I plan to get the thing lasing properly before I worry about metering. How are you going to limit the current to the tube. 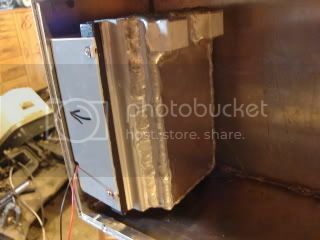 A microwave oven transformer is kinda a brute force beast and can put out a 1/2 Amp or more before burning itself up or other components. 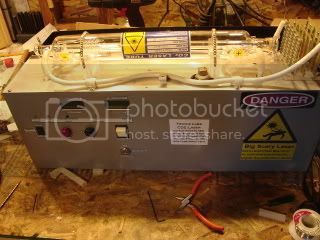 I used a neon sign transformer on my CO2 laser that has been rectified and filtered in addition to ballast resistors. Neon sign transformers are designed to not deliver any more current than they are rated, so they are kinda self regulating. In fact you can short one out with no problems. After all they are built for gas discharge tubes which a CO2 laser is. Also how many watts are you expecting? 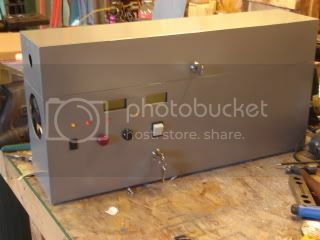 I'm getting about 25 watts from mine however its maximum design is supposed to be about 40watts. Look's Great! I can't wait to see it "FIRE" up! 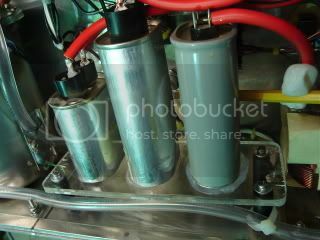 The current will be limited somewhat by the voltage multiplier. However, I have included a ballast resistor bank, which I plan to tap at the spot which gives the correct operating current. The resistor bank is sized so that it will absorb half of the operating voltage, at the tubes proper current rating. I am hoping that this is enough. Should this supply design not work, I am planning to replace it with a simple rectified transformer, based on a 10kV, 22ma oil burner ignition transformer. Ign transformers are rated for arc duty, just like NSTs, & I have a few kicking around. Your tube is a 40W? Quite a bit larger than mine. Have you acquired focus optics for it? My tube is a 15W, & I am expecting full wattage from it. From what I understand, they will deliver quite a bit more than rated power, at a cost of reduced lifespan. 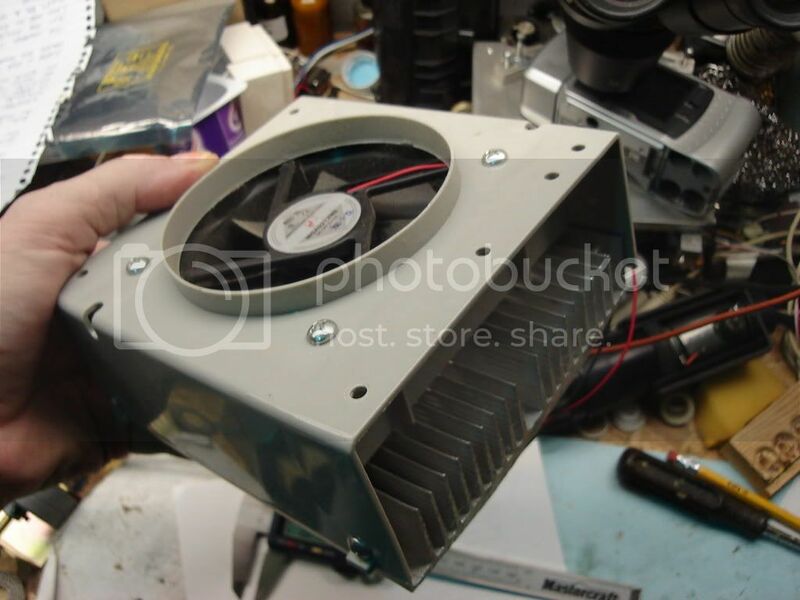 I saw one 40W online, running at better than 75W output. That's fine for those who get their tubes donated, but not for us who have to pay for them. 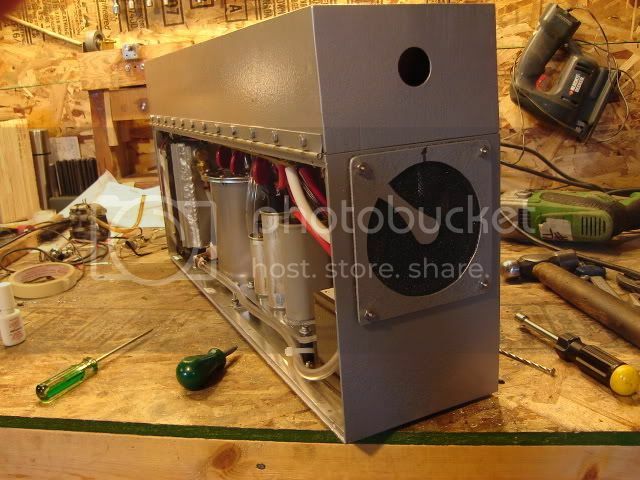 An oil burner transformer should do well too. Yes I got a ZeSe focusing lens from ebay, and I can vaporize brick with it. It's so dam bright it's like a welders arc, you can't look at it. 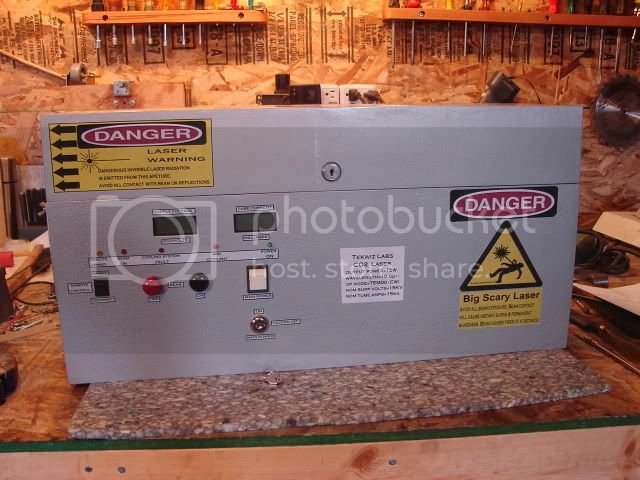 I also recommend a variac transformer to give you some control of voltage. As far as my tube, I constructed it myself (it's not that hard), and the equation's worked out to be about 40 watts, but that's in a perfect world. I'm happy with my 20-25 watts for now, and I'll try to improve it the next round. Perhaps I should just shut up and post some pictures of my setup.. I'll see if I can get to it in the next day or so. Welcome to the forum. You need to make a video of the laser vaporizing a brick! I would love to see that. Yeah, I'd like to see some pix, too. I take it that your laser is a flowing gas type, as opposed to a sealed tube like mine? I had given some thought to tube construction, but I was unsure whether normal machining tolerances were close enough, especially for a sealed tube. 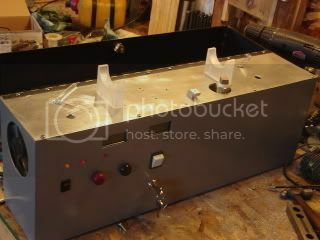 I know about vaporizing brick...I have a firebrick for a beam stop for my laser. You don't want to be testing a laser, only to find that you just set your neighbor's house on fire. Oops. A little off topic with the CO2 laser in this thread, unless it's a 405nm CO2. Don't forget to check out these listings for 405nm and 650nm high powered diodes and modules. NEW LISTING. Included JAV driver kit, just add voltage.